Welcomes well behaved children & dogs. Peak season Saturday Changeover, flexibility at other times. Beautiful location, very well equipped surpassed expectations! Homildon Cottage was amazing. It was so well equipped, very homely and spotlessly clean. There was a gorgeous welcome pack waiting for us which was a lovely touch. We had an amazing stay and hope to return. Thank you. Glad you enjoyed the welcome pack, we had a lot of fun testing local produce for it! Many thanks for the warm review and we very much look forward to having your family and four legged friend to stay again. This is our second time at Homildon Cottage and we thoroughly enjoyed our stay in this beautiful place. The cottage is warm and comfortable and very well equipped . The position was perfect for ourselves and our 3 dogs. It feels like a much loved cottage and we appreciated all the extras , from the welcome pack to the teabags in the cupboard. Wifi worked find and we appreciated access to BBC IPlayer and other Apps on the TV which I think is new on last summer. What is particularly nice is that you can walk out the door onto the hills and miles of footpaths including St Cuthberts Way. Coast is nearby too and is wonderful- Holy Island and Bamburgh in particular. We took advantage of a Sainsbury delivery on arrival and it is possible -and not too arduous- to walk down to the shops in Wooler and back for top up groceries. We hope to return again. Thanks for your review, warmly appreciated. Very pleased to have welcomed you back for another visit, and that you made good use of the new TV! Look forward to having you stay again in the not too distant future. Beautiful cottage in lovely surroundings. The cottage was spotless and beautifully presented with everything we could have needed (and more!). Also lots of space for the whole family, including two dogs. Was a perfect place to take our little girl for her first holiday. Thank you. Thanks for the review, and so pleased to host your daughter's first holiday… I hope it will be her – and your – first visit of many! We had a fantastic time whilst staying at Homildon. The hosts were so thoughtful with little treats which we found on our arrival. The cottage is in a fantastic location close to a range of activities. We thoroughly enjoyed our walks/runs up Homildon Hill! Our boys made great use of the games room which in turn made our life very easy on an evening. My favourite was most definitely the Aga, I loved getting up on a morning and cooking on it! We definitely would love to stay again! Running up 'our' hill sounds pretty impressive! Glad you has such a good time. Thanks for the review, and we'd love to have you stay again sometime soon. Best equipped cottage I've ever come across! It became a game to find something we needed that the cottage didn't have! Thank you for your review … which made us smile! We stay at Homildon regularly ourselves and like having everything for a good holiday to hand. Let us know if anyone did win the "game" to find something we'd missed though, and we'll see what we can do. Hope you can visit again soon. The property has been very thoughtfully furnished, lots of guides, books and maps. Thank you for submitting a review of your stay at Homildon Cottage. We are glad you enjoyed your Family Summer Holiday - and found it a great location for visiting other parts of Northumberland. We hope to welcome you back in the future. Homildon Cottage is in a beautiful location and is extremely well equipped. 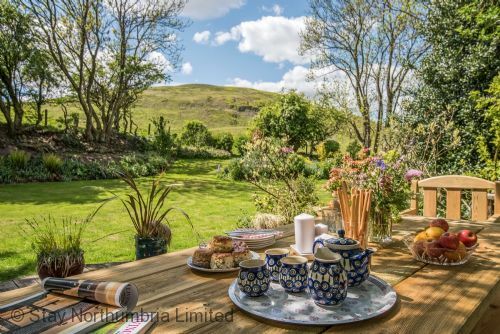 The cottage is quietly situated next to the gate leading onto the Cheviot hills where there are miles of footpaths to follow. The welcome packs for ourselves and our dogs were much appreciated. There is plenty to do in the area and the coast at Bamburgh is an easy drive. We hope to return ! Many thanks for submitting a review of your stay at Hamilton Cottage. We are glad you enjoyed the peace and quiet that the cottage offers, as well as the fantastic views and walks! We hope to welcome you back in the near future. Homildon Cottage situated in a very peaceful location, no traffic noise just accompanied by birdsong and sheep bleating. The cottage was very well appointed and comfortable. 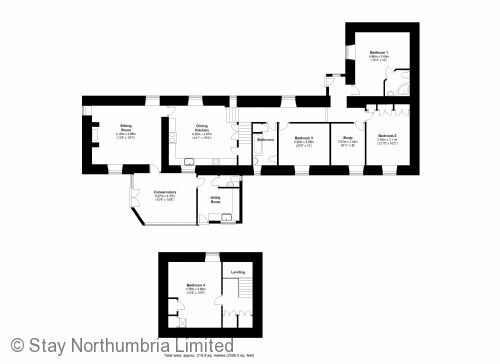 Any problems that we encountered were swiftly resolved by Stay Northumbria and the owner. All this helped us enjoy our re-visit to Northumbria after a number of years. Hopefully it will not be so long before we come again. Thank you for your review of your stay at Homildon Cottage. We are glad you enjoyed the peace, the quiet and the comfort that the property offers. We hope to welcome you back in the near future. We had 4 adults in our party and there was plenty of room for us all in this cottage. The beds were comfortable, the shower pressure good, kitchen the best equipped we've ever had (and we stay in a lot of selfcatering establishments). With the Aga the cottage would be so cosy in winter! It seemed a pity that we didn't need to use the enormous log burner either in the lounge - it all looked so welcoming. The cottage had good lay-out although there are steps up and down to most rooms which may present a problem for those less able. Plenty of brochures and information both on the cottage and the surrounding area. The conservatory was the best place to eat - the visiting rabbits and family of moorhens were great to watch in the lovely pretty garden. Easy access road and safe off-road parking. Easy to get onto the St.Cuthberts way for a late evening walk. Wooler close-by with good eating out - can recommend No1 Hotel and Wine Bar for a tapas meal plus Breeze for a lunch - both very friendly and food good. Just had an issue with the kitchen sink not draining - but this was quickly sorted. The keysafe also failed to lock when we were ready to leave but when we phoned rental company they were very friendly and told us where we should leave the key so we could start our journey home. All in all a good week and we would love to return soon. 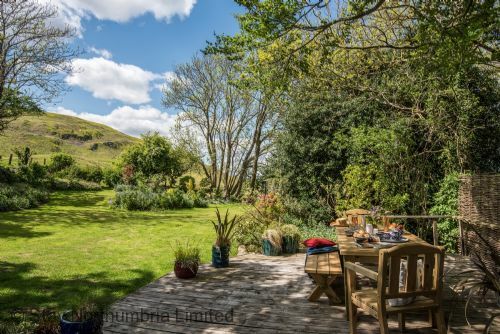 A very beautiful spot right next to Humbleton Hill with the most amazing garden views. 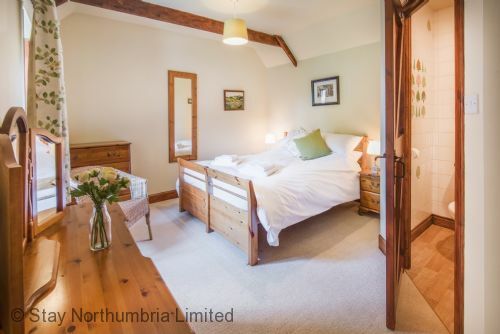 Clea, comfortable and well equipped accommodation perfect for families and just a short walk down to Wooler with its shops and very wonderful dairy ice cream cafe! Thoroughly recommended! Great location for exploring the National Park and the coastline and a peaceful, relaxing break! Really glad you enjoyed your stay and appreciate you taking the time to provide this complimentary review. The ice-cream at the milk bar is fab – and always a new flavour to try! Hope to have you to stay again soon. Second visit to this great cottage. Very well equipped and in a perfect location for walking right from the door. Thank you! Very pleased to have welcomed you back again, and look forward to being the starting point for more great walks in the future. 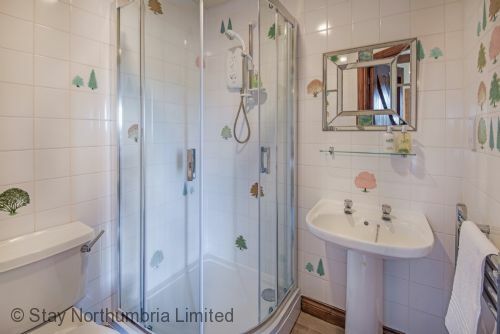 A wonderful cottage perfectly and peacefully situated for exploring the beauty of Northumberland. Wow! What a cottage! 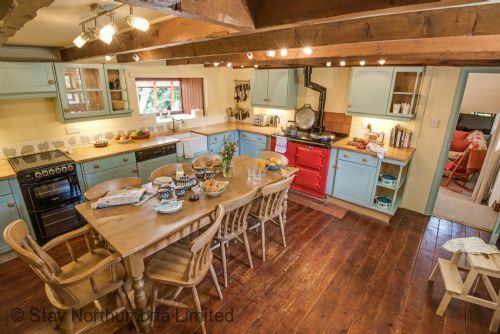 Blissful comfort, a kitchen with Aga to die for and every detail perfect. Breath taking walking in the Cheviots from the garden gate and the stunning coastline just a short drive away. Thank you for a memorable holiday. It was an absolute pleasure to have you to stay and thank you for appreciating the cottage and it's location. We hope you will be able to return soon to walk even more of the National Park's hills and valleys. Homildon is a very comfortable and well-equipped cottage, situated in a beautiful location with a lovely big garden. Lots to do in the area - rich in history - with great walks and the coast only 30 mins away. Stayed with 3 children, 4 adults and a dog - highly recommended ! Great to hear you enjoyed Homildon and its amazing location. Northumberland is an exciting county with so much to do and see. We would love to welcome you back again in the future. We'll be writing more on the cottage's blog about the area's fascinating history very soon! Homildon lived up to all our expectations for a happy stay. This beautiful cottage felt like a truly comfortable Northumberland Tardis, each living space furnished and dressed beautifully. Your welcome pack was lovely, and we particularly enjoyed a glass of the Prosecco you left for us, by the warmth of the woodburning stove! The peace and tranquility of Homildon's location did not disappoint, and a highlight of our stay was stargazing on a clear night with no light pollution at all. Simply magical. Along with Finlay our wee Westie, we managed many walks from the door and had great views and fun along the way. 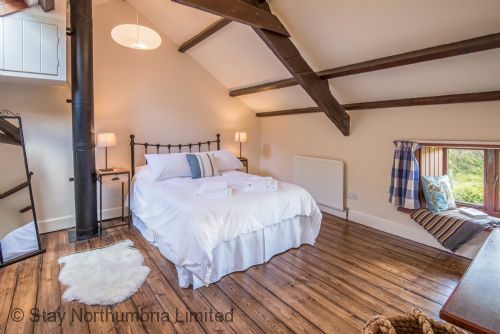 We have stayed in many cottages previously in Northumberland, the Lakes and North Yorkshire and can honestly say that Homildon is probably the loveliest and most comfortable we have stayed in. So glad you had a happy and comfortable stay. In our book you can't beat a day walking, stargazing and unwinding by the fire! We do hope you can return soon. We enjoyed a fantastic stay at Homildon Cottage. 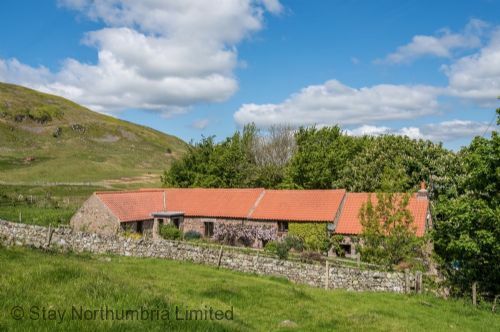 The location is great being right on the edge of the Cheviot Hills with walking and biking routes extending in several directions. Wooler is 5 minutes drive away with a supermarket, shops and good places to eat. The cottage is beautifully presented, fantastically well equipped and very comfortable. Having a decent Boot Room / Utility was really useful. The Kitchen Dining Room complete with Aga is a great space. The cottage was really nicely presented, very clean and the welcome pack on arrival was a very nice touch. There is a really nice garden with an outdoor seating area and lots of bird life. Overall this really is a superb holiday cottage and we really enjoyed our stay there and hope to return soon. Delighted to hear you enjoyed your stay in this wonderful part of Northumberland and that you appreciated everything the house has to offer. We would love to welcome you back again in the future. Excellent cottage in lovely area. We arrived to an aga warmed cosy kitchen with a welcome pack of lots of local produce,much appreciated. We left with lots of wonderful memories of this cottage and this area of northumberland. Delighted you enjoyed everything the cottage and the local area had to offer. If your memories start to fade we would love to welcome you back again. I stayed at Homildon Cottage in September and it had everything we needed and more. The location is perfect especially when taking dogs as the footpath is 2 mins walk from the cottage. Upon arrival the cottage was extremely clean and the basic essentials bread, milk, wine, butter etc. were waiting in the fridge. I hope to return! Thank you for your review. So glad you (and your dogs!) enjoyed the local walks. We always feel we've truly arrived when we get to the top of Humbleton Hill! We look forward to welcoming you back soon. Really super holiday property - much more spacious than imagined from the photographs and has a lovely luxurious feel without you being afraid to touch anything. The location is beautiful with amazing views from every window. All the expected facilities were of good quality, furniture , bedding, towels and fantastically equipped kitchen but there were so many extras - interesting books, music, maps and guides, huge range of games. Good WIFI, TV and sound system particularly appreciated by my late teen/early 20's children. Wooler was a good base for our first trip to Northumberland - all beaches/ towns were easily accessible and the national park is at the end of the garden - there are ample places to eat out including traditional pubs, good Italian and even Tapas. 100% recommend and hope to go back. ..and Thank You for your glowing review! We are so glad you have a lovely time visiting Homildon Cottage. Please do not hesitate to contact us regarding a future booking. Excellent position, peaceful, quiet, beautiful scenery. Ideal base for surrounding areas. Well equipped cottage, spacious, comfy. Thank you! Very glad you enjoyed your stay and look forward to welcoming you back to our tranquil corner of Northumberland soon. This house has an excellent and isolated location. It is very well equippped. The garden is lovely and offers immediate access to the hills. Good to hear you enjoyed your stay at Hamilton Cottage and that you appreciated its location and surroundings. …and thank you for a great review! We're really glad you enjoyed your stay so much, and look forward to seeing you back soon. Our 2nd time to this cottage... another lovely stay, want for nothing, dogs even provided for with bowls and beds. Same the weather wasn't great all week as garden is lovely to sit in and some great walks close by! Pleased to welcome you back to Homildon again, and fingers crossed for warm sunny evenings sitting in the garden when you return! Look forward to seeing you again soon. Fabulous Location , Fabulous Cottage , Never wanted to leave ! An absolutely fabulous weeks stay in Homildon Cottage perfectly positioned for all the walks we wanted to do , the cottage was clean and very comfortable with a very fully equipped kitchen with a large family sized table and an Aga which my Wife loved , having never used one before cooked all the meals with it , The cottage also had plenty of local maps for walks in the area and lots of information on the local area itself , the garden is a complete joy , very peaceful and full of a variety of birds that came to the feeders every day while we were having coffee in the sun room before we set off on our long walks into the Cheviots , the weather was very kind to us and to be honest we did not want to leave EVER . It's the best place we have stayed in Northumberland so far and we have been coming to the area for the past 5 years or so and i'm sure we will be booking again in the future . Long walks into the Cheviots and watching the birds flock to the feeders – sounds ideal to us, and so glad you enjoyed it too! Thank you for rating it the best so far, and very much hope to welcome you back to try out the Aga again soon. We entered through the Utility Room, to discover our dog's every comfort met, through the conservatory, into the lounge wowing all the way - however opening the door into the kitchen took us into a different dimension - a real family room with everything one could possibly imagine - the immediate response was "we'll stay forever". The rest of the house and gardens did nothing to dispel our first reaction - lovely beds, linen and towels. The position, sitting below Homildon Hill, is impressive, as is the whole area. When are 2018 bookings opening - can't wait!. We are delighted you enjoyed your stay at Homildon so much and thank you for such a glowing review. 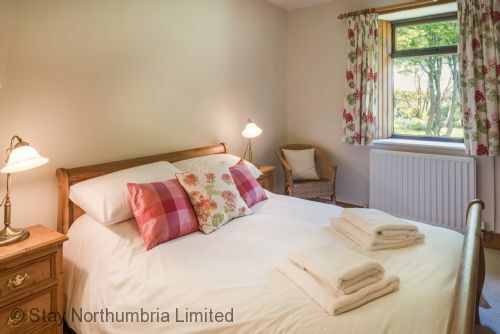 If you are considering a return next year, please do get in touch with Stay Northumbria and we'd be happy to provide you with a quote. Lovely cottage ,in wonderful location(walks straight from door)but close to town amenities if needed. Very well equipped,warm and cosy. The owners had left a very generous welcome pack which was much appreciated. We even had sunny weather for most of the week we stayed. We are really glad you enjoyed your stay, walks from the house and our welcome pack (we had a lot of fun choosing local produce to include!). We'd be delighted to welcome you again in the future. We've just returned from our second week at Homildon and this one was just as blissful as the first. The views are breathtaking, I spent so much time sitting on the bench outside admiring the view but also staring out of the kitchen window watching the birds feeding. Inspired by our last visit to Homildon I am now the proud owner of my own telescope which came to the house with me. I can't believe how dark it is around Wooler and it was so easy to pick out the colours in the stars and we had an amazing view of Jupiter from the front of the house. A telescope is provided at the house along with the necessary stargazing equipment but we didn't need it this time. The house is so comfortable and well equipped. We particularly loved sitting by the AGA eating breakfast and enjoying the sunshine that streams in from the front of the house. The log fire made us very toasty on the cold nights. The utility room made it a breeze to clean the dogs up after their walks. There are so many places to visit within an hours drive, both in Northumberland and in the borders, too many to list in a review. Thanks again to the owners and to Caroline who made everything so lovely for our arrival, we'll be back again soon. Very pleased to have been able to welcome you back to Homildon Cottage – and that you had another blissful week. We can (and often do) spend hours gazing at the heavens at Homildon, so best of luck with your new telescope! Many thanks for the review, and we look forward to seeing you again. What an amazing cottage. Everything had been thoughtfully catered for even down to the smallest attention to detail. A true home for the week we stayed. Everything was done to the highest standards and the location, away from it all was heavenly. With so much to explore within 30 minutes drive we will definitely be back. We didn't want to leave!! Homildon Cottage is very much a home from home for us. So glad to have been able to share this with you – and that you loved it as much as we do. Thank you for your review, and we look forward to welcoming you back for another stay sometime soon! Homildon Cottage is a very special place, its in a stunning location with views galore and walks from the door. We were even provided with a telescope for star gazing and who knew all of those stars were up there when you escape from light polluted areas. The cottage has a superb log burner for cozy evenings and a toasty aga in the kitchen which made the dogs happy. Fabulous cottage, we have already booked another week. Thank you for your wonderful review of your recent stay at Homildon Cottage. We are so pleased that you enjoyed the cottage and the area so much that you have already booked to come again. We look forward to welcoming you back. We had a fantastic Autumn break at Homildon Cottage, everything was perfect and very high spec. The Cottage is in a great place really quiet, lovely and warm and cosy. The welcome pack was a great surprise and a lovely thought, dogs appreciated theirs too! Everything was really luxurious great bed linen and towels. The whole family of 6 had a great time we will definitely recommend and return. Thank you. From first booking to leaving the cottage was really spot on. When we had paid the total amount for the holiday we received a 14 page information pack online, so we knew exactly what to expect - right down to the equipment in the kitchen. This greatly eased our packing process ! Everything you could possibly need was there for us - including for our four legged friend, who had her own welcome pack ! And the location ! 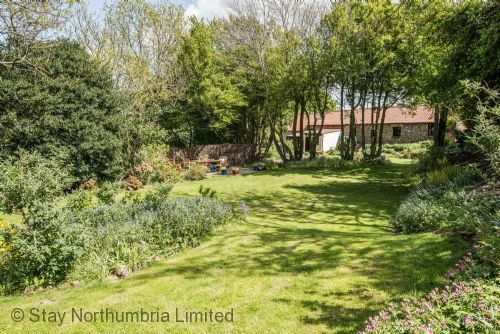 A few hundred yards up a country track, right on the edge of the Northumberland Park with a lovely walk to Humbleton Hill literally from the back door, yet a 20 minute walk to the centre of Wooler. We cooked on the Aga all week, also a joy. So glad you found the information pack useful in advance of your stay, and more importantly that you (and your dog!) enjoyed the stay itself. We agree it’s a very special spot – and hope to welcome you again in future. The cottage is extremely well appointed, comfortable and in a beautiful location. 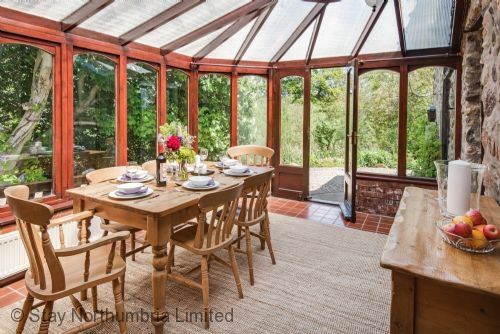 The kitchen is very cosy and the conservatory adds a lovely light room to the ample space. 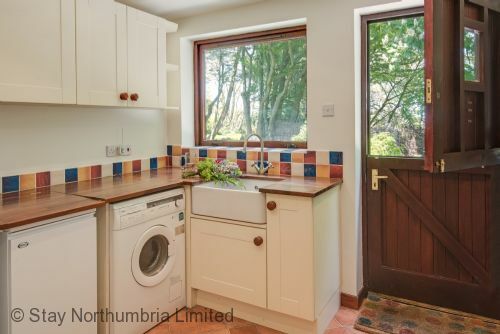 The house, utility room, garden and shed contain everything you could possibly need. 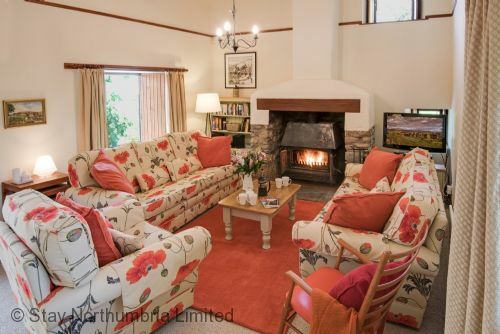 The location is excellent for both the coast and the hills and conveniently close to Wooler for shops and cafes. There are lovely walks on the doorstep. We would have liked to have more time to explore the area from this base and to make more use of all the house has to offer. Many thanks for your review. We are really pleased that you enjoyed your stay & that Homildon Cottage suited your needs. We very much look forward to welcoming you back in the very near future. The owners are glad you enjoyed your stay and found Homildon Cottage homely and accommodating. The owners say they love to cook themselves and are never happier than well bustling in front of the AGA! Much appreciate your feedback on the master bedroom which will be addressed by the owners. In the meantime they contacted the local Council again about the potholes and are pleased to say they were repaired on 02/09/16. Finally the owners are delighted you liked their welcome pack – they had a lot of fun sampling local produce to put it together – and look forward to welcoming you back at Homildon in the future. We stayed at Homildon Cottage at the beginning of August. The cottage is wonderful. Everything you could possible wish for is there. Rooms were very comfortable, the kitchen extremely well equipped and the garden and surrounding countryside is beautiful. The only downside is the very narrow lane leading to the cottage which is in poor condition. The potholes need dealing with, if only filling with gravel, as they are impossible to avoid. A beautiful cottage very welcoming and lovely sized rooms.. The beds extremely comfortable lots to see and do especially if you are into walking the countryside is so beautiful. A very enjoyable stay. Thank you for submitting a review about Homildon Cottage. It is ideally situated for country walks and we are pleased you enjoyed your stay. Location - great, very quiet, only occasional walkers go past, walk out of garden to beautiful countryside. Shops and places to eat close by. 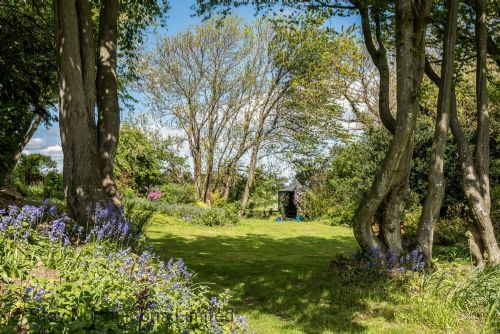 Blissful, well maintained garden and stunning views. Loved the cottage! Never have we visited a more well equipped kitchen and living spaces. A short sentence that doesn't describe how delightful it is to find everything you have at home .... and sharp knives! (Keeping the chefs happy). Loved that all 7 of us could sit at each of the two tables. All the beds were all extremely comfortable. Lovely bathroom and towels. Everything throughout the cottage was of a high quality. Description for this cottage is 100% accurate but doesn't covey the quality found - we have been to many cottages that comply with the description but are so disappointing when we arrive to find the very minimal of facilities. Top of our list for a return visit. Many thanks for your glowing review. We are very pleased that you appreciated both the location and the cottage. Hopefully you will return again in the future. Very comfortable and extremely well equipped cottage - the owner's have really thought about all the things you might need on a week away. However, the location of the cottage was the real highlight for us. The cottage is close to a largish town so doesn't feel at all isolated (it was a very pleasant 20 minute walk to Wooler where there were plenty of shops and pubs to get everything we needed for the week) but at the same time it's on the edge of the national park so there are miles of footpaths right from the door. We did a lovely 12 km one day and didn't have to cross, or even go near, a single road. Plus it's only a half hour drive to Bambrugh, Lindisfarne and Alnwick so you can easily explore the rest of the region. We had a fantastic week and would definitely like to return one day! Thank you for your lovely review. It’s great to learn that everything was provided for your stay and that you had a wonderful holiday. We would love to welcome you back for another stay in the future. Amazing cottage... All your need are catered for, even the dogs!! Lovely walks on door steps. Residents from the village we bump into we're all very friendly and happy to have a chat while out walking the dogs. We had a problem with hot water and heating during our stay... But we phoned Caroline (the contact number left) and someone was round within 30 mins and the problem was sorted. We will defiantly be back to stay again!! We found Homildon Cottage an excellent place to stay. The cottage itself is first class and would receive five star ratings in any review and the location is perfect. The scenery and serenity is superb with numerous paths out into the Northumberland National Park right on outside the door. Then, not far away, are places like Lindisfarne, Annick Gardens and Keilder. 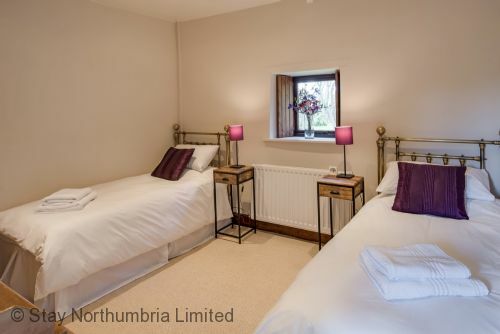 If the occasion arose we would go back and we are recommending Stay Northumbria Limited and Homildon Cottage to family, friends and neighbours. Absolutely fabulous cottage in a wonderful location. Only 20 - 30 mins by car to the beautiful coastline of Northumbria. Countryside walks from the cottage door and peace and quiet in the garden. Wonderful to be able to stay in a cottage where the dogs are made as welcome as their owners ! This was such a lovely cottage. 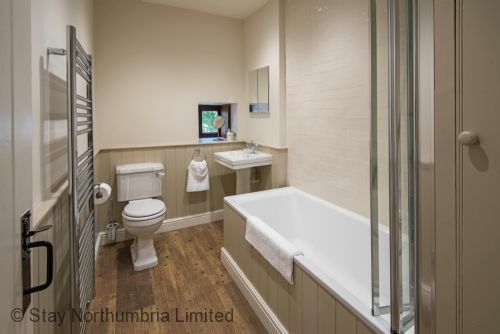 The close proximity to the Northumberland National Park was just one of the great features. The garden was really homely and well-landscaped with lovely views. The AGA in the kitchen made the house really cosy and was really useful for slow cooking things. It slowed us down and made us appreciate the lovely kitchen and helped us relax. The living room had a cosy fire with logs etc provided - we were spoiled with good tv facilities (we don't have a telly at home). The gated and fenced garden was sufficiently secure for our two old greyhounds. The bathroom was really nice with underfloor heating (what a luxury)! There were so many nice little surprises and other items left by the owners - treats for the dogs + various other things such as dog beds and towels for us to use; some milk and lots of small local produce treats, such as honey, biscuits for cheese + a really nice ground coffee. Everything had been thought of and provided by the hosts so there is no need to take anything with you. It's also only 30 mins drive from fantastic beaches on the east coast. Overall, we had a great, relaxing week - despite some really bad weather. The local amenities were more than sufficient for our needs. We recommend the beaches for dog walks and it's worth a drive & trek to Duddo stone circle a few miles away. The Red Lion pub in Milford did great home-made pies - a recommendation in the extensive and well researched info pack in the cottage. Overall, a really great place to stay and would definitely go back again. Homildon is a very well equipped, comfortable cottage with everything you need. Welcoming packs for humans and canines very enjoyable. Beautiful garden with plenty of running space for children and dogs, excellent for outside eating or quiet contemplation with a book. 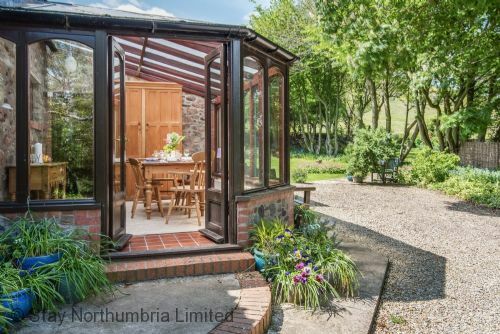 Although Homildon could be considered to be off the beaten track it's setting is beautiful with magnificent walks on the doorstep and easy access within minutes to the local town of Wooler for shopping and eating. An half hour drive sees you at the coast where our grandchildren had a ball on the lovely beaches, boat trips and exploring the splendid castles. If you want a bright lights holiday this is not for you but if you love the countryside, nature, walking and easy visits to the seaside I would recommend Homildon.